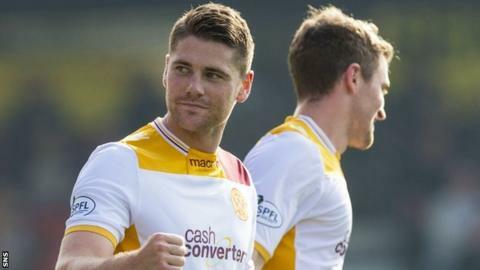 Motherwell manager Stuart McCall is looking for more of the same from Iain Vigurs after the midfielder's stunning strike in the 2-1 win over Ross County. "We know Vigurs is capable of that and we need him to do more of it because he's got a fantastic left foot," McCall told BBC Scotland. McCall was also hopeful that John Sutton's fine goal - his first of the season - would prove significant. "It will be good for his confidence," said the manager. Victory in Dingwall ended Motherwell's run of four straight defeats. "Three really important points for us," McCall said. "I still believe we can get better, but I am pleased to get some players back and that's the strongest bench we've had. "The key thing is that we have players back and hopefully that can be a platform. "We play Celtic next week, which will be a difficult one. But I look round the squad and the strength we have now and that will be important for the coming weeks." County threatened a late comeback after Liam Boyce pulled a goal back. "I thought we were okay," added McCall. "I said at half time I thought we needed to improve. "Our possession and passing of the ball was not good enough and it's taken two fantastic goals to win the game today. "But I thought we were comfortable at 2-0 and the game was petering out and, although we're disappointed with the goal we lost, which gives them a lift, I thought in the end we managed to see it out fairly well."